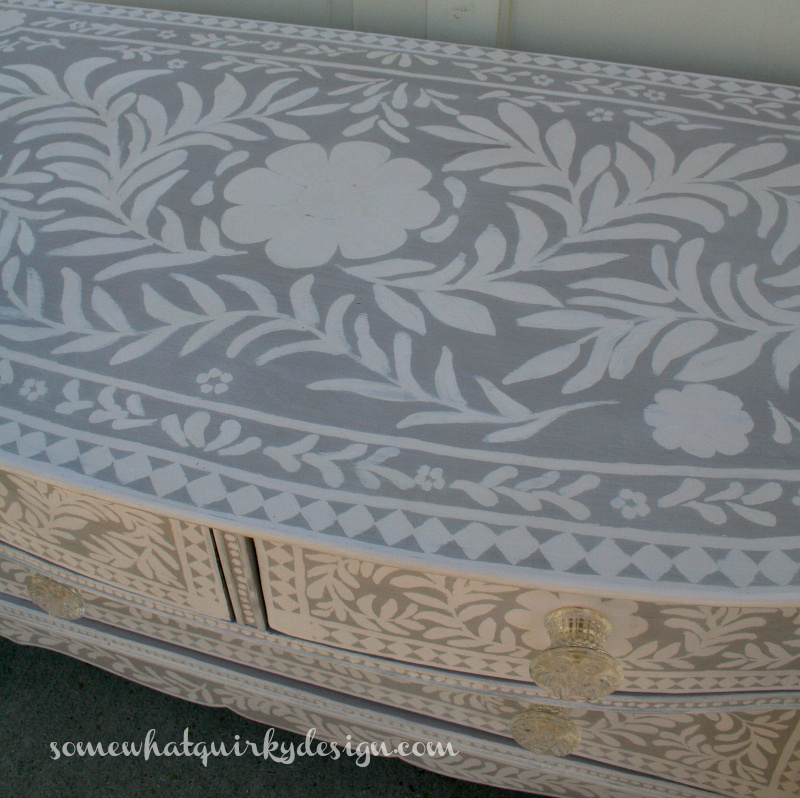 You know those inlay dressers, don't you? I need $2,700.00 for lots of things that take priority over inlay furniture. 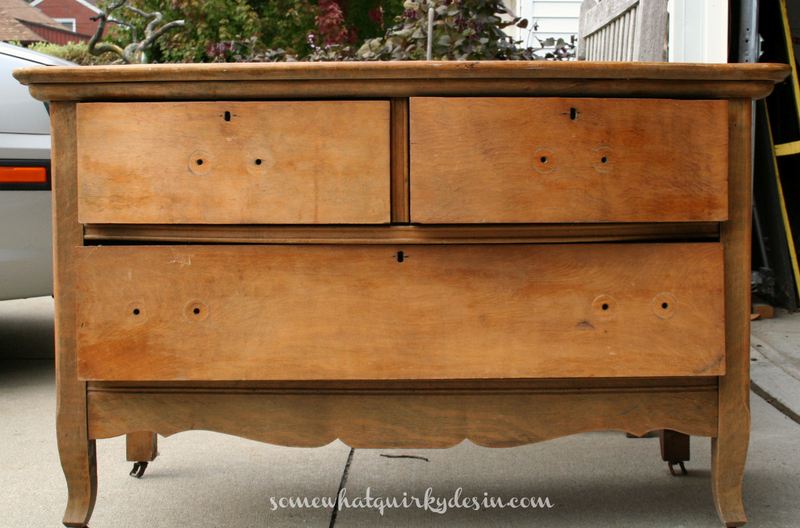 One of the first things I ever pinned was this dresser. 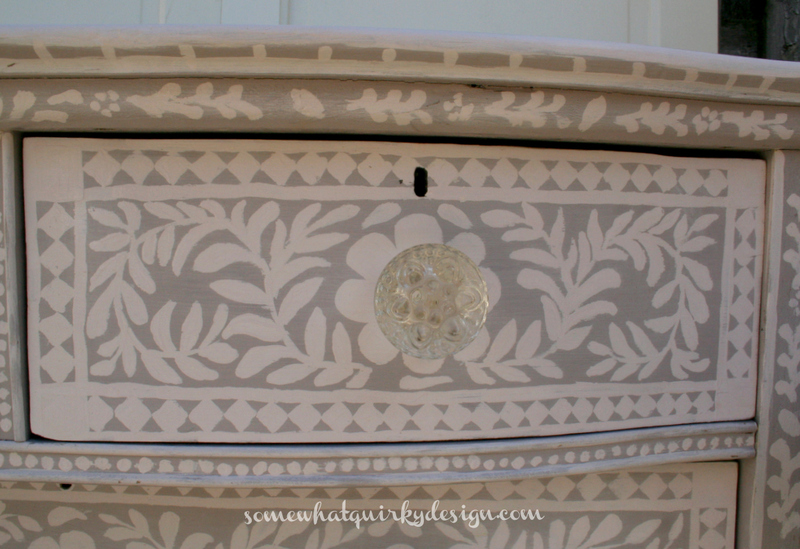 I have always loved what Jenny did - creating a diy version of an inlay dresser. Two birthdays ago I was out saleing (I guess that isn't really a word) and found this dresser in front of a neighbors house with a free sign on it. It had 3 handles, not four and two of the wooden wheels had broken off. A week ago today I got out my Chalk Paint® - in Paloma - by Annie Sloan and painted that puppy. 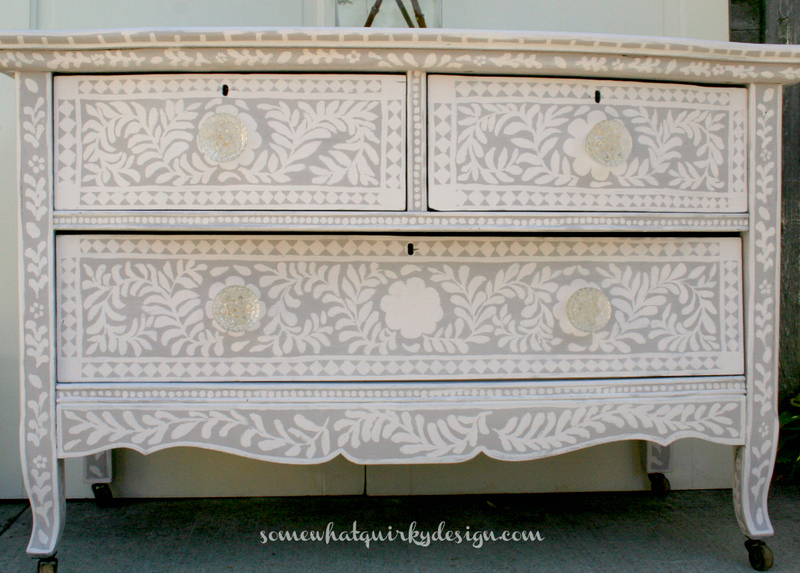 Then I decided that this would be the dresser that got the painted inlay treatment. So I put the picture I was using for my inspiration on my laptop screen. 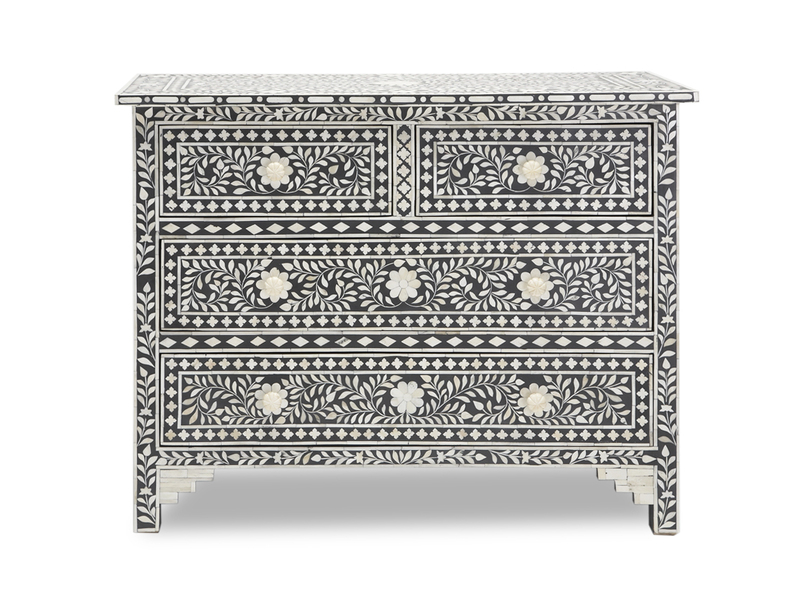 I sat down in the floor and started drawing my design on the dresser. A few hours later I was ready to paint. 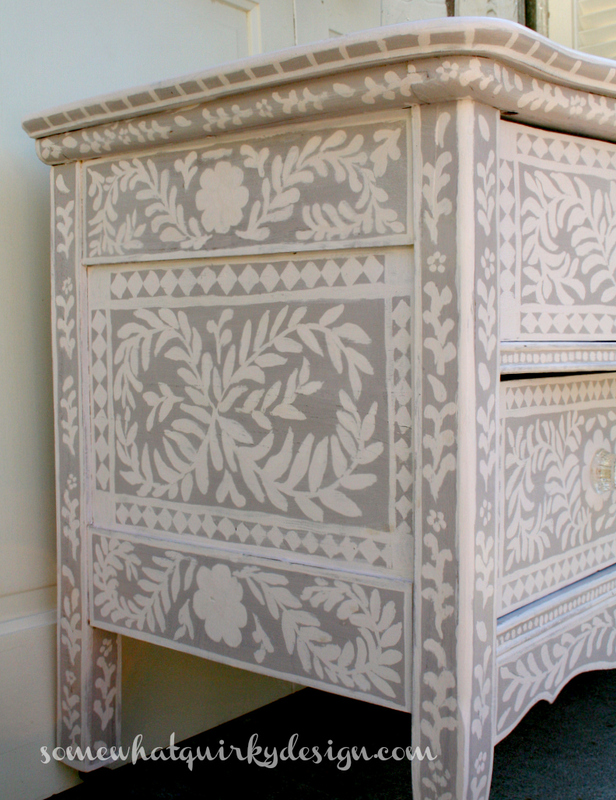 I used a mix of Chalk Paint® colors for the decorative painting - Old White, Paloma, and Antoinette. Then I started painting over everything I had just drawn on with chalk. It was a lot of painting. I didn't try to paint it perfect. I tried to paint it done. I have to admit here that Chalk Paint® is NOT the most appropriate paint for decorative painting. It is too thick. I kept thinning the paint with water. For the most part it turned out just fine, but I do wish I had taken the time to go to the store and buy some acrylic paint to do this with. It just leaves a smoother finish and is much more cooperative with the brushes. I wanted it to be kind of shiny - like inlay is. Isn't that Paloma color beautiful? 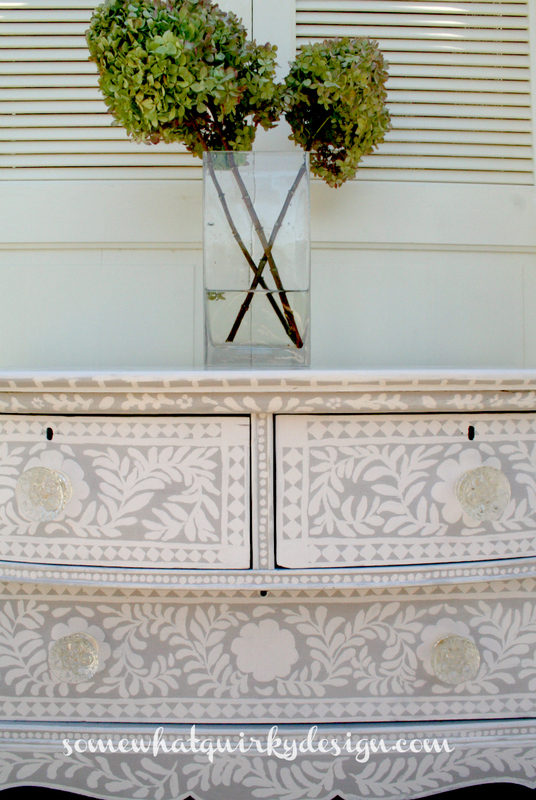 Would you spend 3 days doing decorative painting on a dresser? WOW WOW AND WOW!!!! That is quit a job. It's spectacular and I hope someone buys it that will just love it to bits. You did a phenomenal job on that piece, Karen. Oh, Karen, it IS spectacular! I hope you are sharing this on more than just BNOTP. It needs to ne seen and featured! Great job! I am so impressed!! I do believe I am loving yours way more than your inspiration photo! Job very well done!! I am sure this sells quickly and will be well worth your time!! Pat yourself on the back for this piece!! karen- what an amazing job you did on that piece. Love it! Ohhhh I like yours much better than the expensive one. Yours is amazing! Definitely pinning this! Beautiful job! I can't believe you did it all yourself. You have far more patience than I do :) I am very impressed. Get outta town! This is over the top gorgeous!!!! If you can do this, you encourage me to try as well. Defintiely pinning this for inspiration. Thank you for sharing! I suspect your neighbors would tip over if they saw their dresser now. Absolutely beautiful. We should pass a petition to making saleing/saling a word. Very pretty! That's a crazy amount of painting but the look was well worth it, amazing! It looks wonderful. I have an old dresser in my basement that I want to do something with... maybe I should try to do some inlay.. Pinning this. I am both screaming and drooling - not a pretty sight. 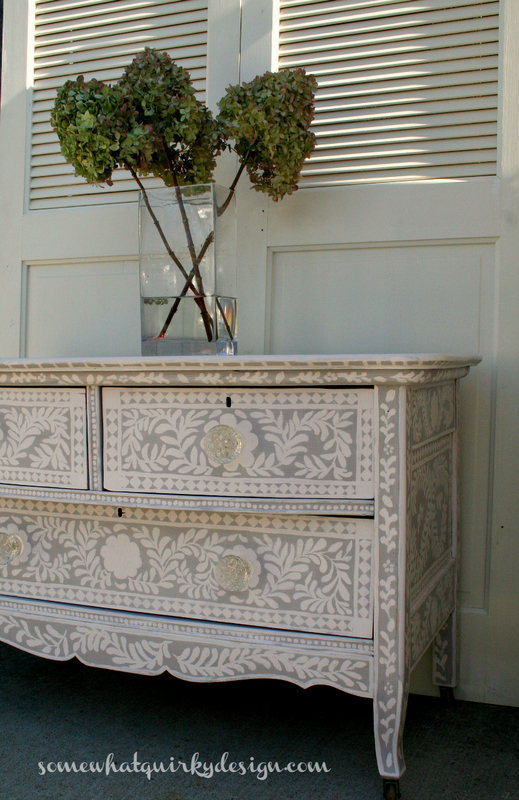 This is the best dresser I have seen. Please share this everywhere - it deserves to be the Queen of Dresserdom. I am pinning, sharing, and loving it to death. That is just STUNNING Karen! What a LOT of work! I love it! Oh my gosh! That is beautiful and I cannot believe you had the patience to do that and then put it up for sale??? I'd have kept it forever! Spectacular doesn't do it justice! We need a much bigger and better word for this amazing masterpiece that you created by hand!!!! Wowza!!!! I'm blown away!!!! WOWZERS! That is so gorgeous!! Holy moly i love it! Totally in love! Great job! Wasn't this the dresser we picked up on your birthday? Wow-toatlly a stunner! I love everything about it and you did a great job! Just gorgeous! What a wonderful transformation. You did an amazing job! I can't believe you hand painted all that amazing detail! Lovely! Love it! I've had an inlay dresser pinned to try and recreate for quite some time and haven't ever gotten around to it. You found the perfect piece for this treatment. Just wow!! Oh Wow, that is a lot of painting! I know how long this takes. It is gorgeous, but I can't believe you are putting it up for sale after all of that hard work! Thanks for sharing with SYC. Hi Karen, just hopping back to let you know that I will be featuring you at SYC this week. That'll sell in no time flat ! I LOVE it! It must be hard to sell something SO beautiful. You have set the bar high for the rest of us furniture painters! So glad I found you over at Jann's party. Magnifique, Karen. It's incredible. Congratulations on being featured by Miss Mustard Seed. Totally fabulous! You must have the patience of a saint. This is just awesome!! I have been itching to do something similar and you just gave me the courage to go for it! This is such a beautiful piece - so worth sticking with the patience, stunning! Congrats! yes, it IS spectacular! 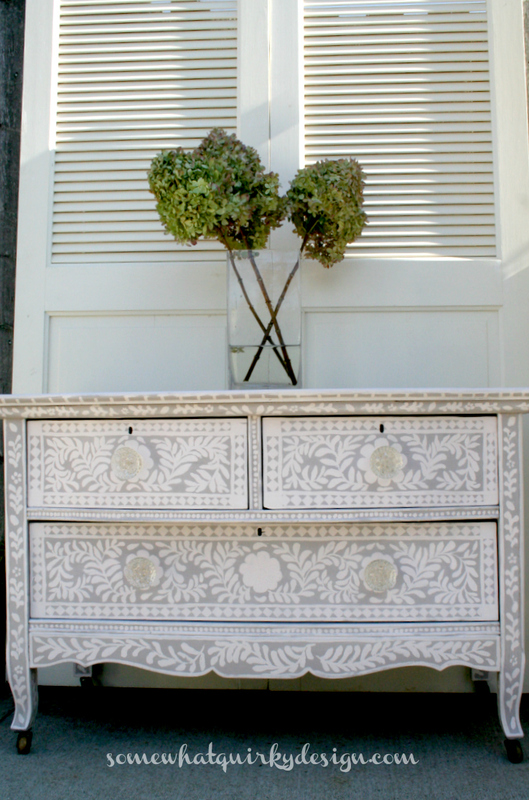 I am in the middle of a chalk paint project and you have inspired me to add some design, thanks, gorgeous gorgeous gorgeous! I absolutely love this. I have a dresser that I've been thinking about for 3 years. I know, that's a long time to think, but now I know what to do. You're so clever.